A one night exploration of the famous Bukit Tapan road. Walk the trail during the twilight and dawn hours when many of the island’s most interesting creatures are active. From Sungai Penuh, drive up to Bukit Tapan in the afternoon. Set up camp, and then walk or drive along the road in the late afternoon hours and into early evening (best time for crepuscular wildlife). On your way down the mountain, you could explore the little forest trails that lead off from the main road – at the end of one of them, you’ll see a 15+ meter tall waterfall. Eat dinner at the small warung (road-side restaurant) near the top of the mountain. Continue walking/driving after dinner, using powerful flashlights to spot wildlife. When you’re ready to turn in, head back to camp. In the morning, have some breakfast at the warung and continue walking or driving along the trail. Check out the old Japanese cave and the guard post near the river that have been colonized by swiftlets and bats. 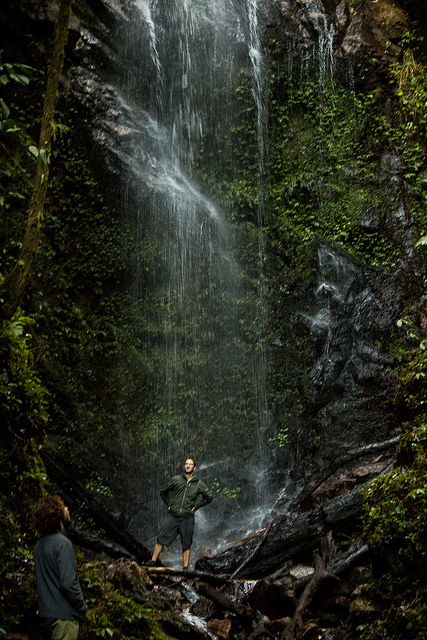 Head back to Sungai Penuh before noon to continue your adventures in Kerinci. Total Cost: 1,900,000 IDR for two people. 1,200,000 IDR if not camping. Conditions: Easy walking along a paved mountain road that cuts through the National Park. It can get a bit chilly at night, so bring a jacket or enough clothes to layer up. You’ll appreciate having a beanie to keep your ears warm. Price includes a local guide/driver, a rental car, transport within Kerinci to and from the trail head, flashlights, and all food and equipment. Price per person reduced with more than two travelers, but usually limited to a max of four people to lessen the impact on the environment.